Many of you may have already met Dr Edward Houston who started with us last year. Dr Houston started with us to assist our team of dentists after Dr Paddison’s accident and to assist with looking after his patients. Dr Houston has been part of the Medland Family for many years prior to this however as he is also married to our hygienist, Annika. 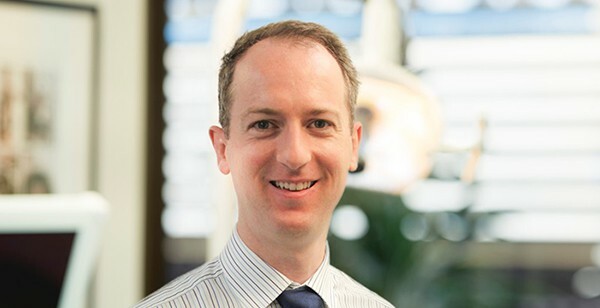 What you may not know is that Dr Houston is an Endodontist, which means that he has undertaken special post-graduate training in root canal therapy and is a registered dental specialist. In the last twelve months our patients that have seen Dr Houston have appreciated experiencing the benefits of specialist care whilst still enjoying the familiar Medland Dental care, service and surrounds. Patients who see Dr Houston for treatment are also still able to use nitrous oxide (happy gas) throughout their treatment, which is something external specialists may not be able to offer. We are pleased to announce that Dr Houston will be staying on as our in-house Endodontist and will be in the practice every second Monday and Friday. Confident in the knowledge their patients are receiving exceptional specialist treatment with Dr Houston; Dr Lillicrap, Dr Kam, Dr Morrison and Dr Yang are able to ensure all of Dr Paddison’s and their own patients are well cared for whilst we undertake a careful search for a new dentist to join the team. You can read more about Dr Houston here.